Recipe submitted by Hedy Lukas, Director of Marketing Services, Kimberly-Clark Corporation. 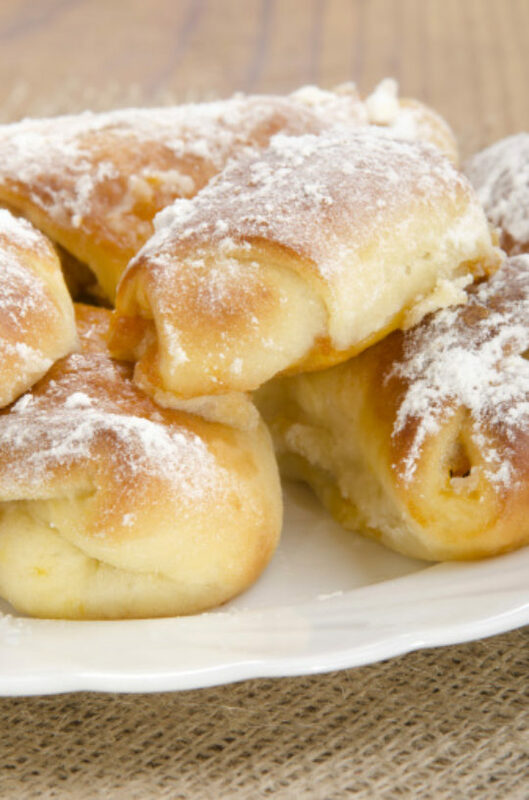 Grandma’s Horns are similar to croissants, covered in a sticky sweet powdered sugar frosting. Almond paste filling makes these Horns gooey and distinctive on your tongue. Grandma would certainly approve of you making her special recipe for the rest of the family. You might consider making a "Family Favorite Recipe Book" for a holiday gift, so everyone can share in Grandma’s cooking! Mix together flour, salt and yeast. Cut butter into flour, and add egg yolks, sour cream and vanilla. Kneed and form into ball. Flour board with powdered sugar. Divide dough into 6 portions. Roll each portion in a 12-inch circle. Next, create the filling. Beat butter and add paste and sugar. Then add the egg whites and almond extract and mix. Add Zwieback and mix. Cut each circle into 8 wedges. Roll up wedges, starting at widest edge. Bake 15 minutes at 350 degrees until slightly brown. Once the horns are cooked, you can add the frosting. Start by melting the butter in a sauce pan. While over a low heat, add half the sugar and lemon and orange juices. Mix well. Add remaining sugar, juices and rum. Keep stirring until the frosting is thick and glossy. Apply frosting to cooled horns. Baker’s Tip: Consider making a "Family Favorite Recipe Book" for a holiday gift, so everyone can share in Grandma’s cooking!